The cottage is warm, comfortable and spacious and Morag and Hector have thought of everything. It’s a wonderful, peaceful place to be. I wish I could take the view home….superb cottage, best we’ve ever stayed in. We have found the cottage very comfortable and well equipped and very central for our trips around every corner of the Island. Thank you so much Morag & Hector for providing such homely accommodation for our stay on Skye, and what a view. Had a great week, cottage really comfortable and well equipped, and the view is tremendous. Never realised watching water could be so fascinating. Fantastic, magical week. 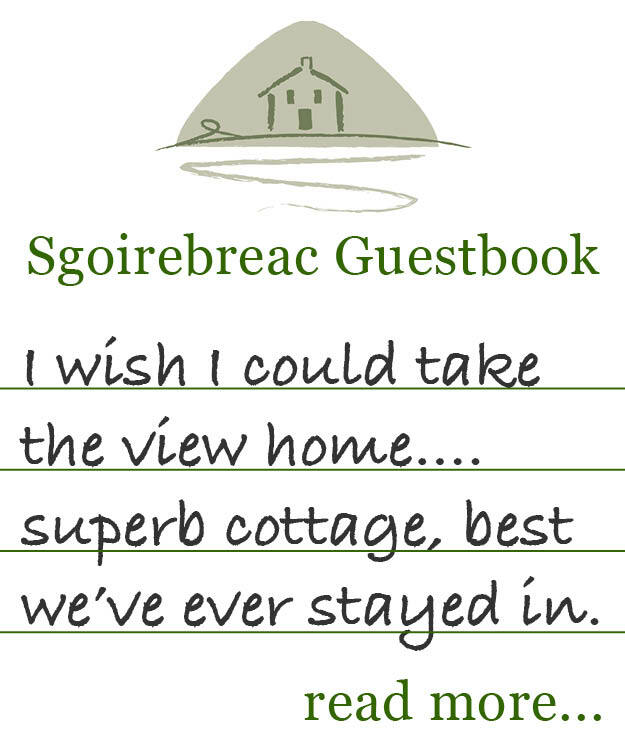 We loved everything about the cottage, with its superb outlook. The best fortnight we have spent on the British Isles, the cottage is warm and cosy and has everything including the finest view we’ve seen for decades. Michael & Catherine, Lake District. Best equipped cottage ever. With the most relaxing view. Good location for all of Skye. Have really enjoyed our stay here, the cottage has everything we needed. We even saw an otter from the window one evening. We will defiantly be back. What a perfect setting for the cottage, stunning views and central for all parts of the Island. A real home from home. We have been luck enough to have done a 6 month round the world trip. However our week on The Isle of Skye ranks with the best scenery anywhere in the world. The cottage was our very own home away from home, and on our last morning at 7am we saw an otter slide into the Loch and swim away leaving its ‘V’ behind it. Worth the wait.